Drawn again for pig, in good old familiar unit 20A. Not a bad way to begin the 2008 hunting year. Since ‘camp’ is about 65 miles from home, three of us left early enough on opening morning to be in the country at first light. That portion of our day worked to plan. Then we met reality. Sure, javelina had been in the area, leaving sign less than a week old – it had rained four days prior. But you know what they say, the only tracks that matter are the ones with a critter still in them. Daniel came close that day. So close that they woofed at him, yet, he never saw the ghosts of the desert. By the end of that Friday I had carried my Kimber and G2 Contender for nothing. Why those two? Experiences from previous hunts, for the most part. In the brush on north-facing hillsides occasionally the peccary bust out close to you. A scoped single shot is not the best tool then. My Kimber with its composite frame is lighter than a bottle of water, and a hollow-pointed .45 is convincing enough. Carried in a common hip holster that weapon is quickly employed. Then there is the opposite scenario. You spy the rascals in the open, have time for a stalk, an ambush. Then a rifle-like weapon would be oh-so-right. With HAM-rules in effect (Handgun-Archery-Muzzleloader), a scoped Contender in a shoulder holster fills this bill quite well. Carrying both guns really is less effort than keeping a rifle balanced on one’s shoulder, certainly in rugged pig terrain. For years I schlepped a ten inch 7TCU around. It is deadly, no doubt. Several porkers can no longer argue against that. The 7TCU, at least that one, was also far from perfection. Most annoying was extraction. I had to engage the extractor groove with another cartridge to pull a fired case from the chamber. That ten-inch barrel is also loud. And Uncle Mike’s shoulder holster had room for more barrel length. For twelve inches, to be exact, whereas I consider the fourteen-inch version too bulky. A 7-30 Waters may be the logical choice to solve the extraction issue. But that number burns even more fuel. So would a 30-30 Winchester. A .357 Magnum or even Maximum would not shoot as flat, or would do so with considerably more recoil. Then I remembered the old and now practically dead wildcat designed by Steve Herrett. He had shortened a 30-30 case, and given it more shoulder angle. Sure looked to me that the .30 Herrett holds promise to be the best compromise between extraction, trajectory, powder consumption and recoil, as long as I wanted to pursue nothing larger than deer with it. The search began. Out of production, it was either a matter of going for a custom-made barrel, or finding a used one. Custom seemed to make the most sense since I wanted the barrel to be twelve inches long. Then I lucked out, found an original TC version in fourteen inch configuration. My buddy Ron took on the job to cut it back. And since he was at it, I also asked him to cut a few fluted channels, more for reducing weight than for looks. He succeeded with both. Testing that .30 Herrett barrel was pure pleasure. 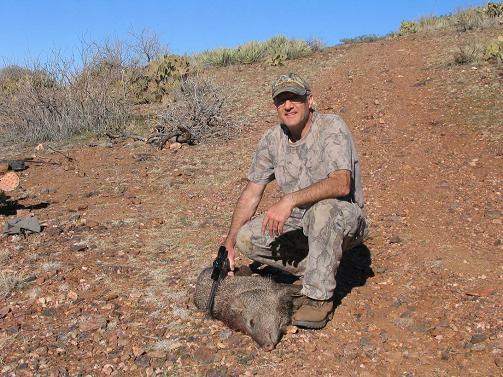 From the outset lighter projectiles, 110 grainers, got my nod because they are sufficient for the rather small javelina, would yield flatter trajectories while minimizing recoil. Plus, the round-nose versions can be purchased relatively cheap. Since an 8-pound keg of H4227 was on hand my testing concentrated on such combinations. For the hunt the Speer 110 grain Spirepoint trumped those round nosers, fueld by a maximum charge of H4227. As has been my experience, a Contender shoots better than I can hold it. This is from real field conditions. When we do that trigger part correctly, the bullets fly where we aim. Practicing at rocks, actually hitting those that were smaller than javelina chests, built great confidence. On Saturday Doug headed out of camp due east, while Daniel and I wandered northerly. By 10 AM we were no smarter with regard to javelina whereabouts. Then Daniel and I split up as well, with him circling back, me heading down the slope, with the idea to walk back up in the bottom of the wash below. Once there, however, I changed my mind – those things happen. Instead, I reached, then followed Turkey creek and ascended the next ravine. Steep schtuff, slow going. Soon, I ran across what looked like mighty fresh tracks. They headed back down the hill, even further away from camp. But isn’t this what we had been looking for!? Due to the recent rain most of the ground was soft. This allowed tracking. And after about two hundred paces, ACTION! One very upset porker woofed while busting away. The Kimber left its holster immediately. Buster kept woofing, but did not show himself again. Then his protests faded somewhat – he was heading downhill. Darn! Oh, but wait. Silly him was now near the bottom of the opposite slope, wide in the open, broadside, back hair all puffed up, maybe sixty or seventy paces out. I would have taken that shot, but I didn’t need to. Confidently the Kimber returned to its holster, in favor of the TC. Buster hadn’t moved. Hmm, better to squeeze ear plugs in, hearing isn’t the best anymore already. OK, just in case let’s also have that little homemade ammo wallet ready. All this confidence almost cost me. Because now, where I’m about to sit down to take the shot, Buster sensed that nothing good was going down, and headed uphill. Then a second pig emerged. It was closer, so the crosshairs moved there. It was also way nervous, running more sideways than up. Which means … also closer and closer to the saving brush. The crosshairs stayed with it. And of course, when it finally paused, it did so behind the only little bush around on that south-facing slope. Only its head was clear, by then easily a hundred steps out. The crosshairs were on that head, surprisingly steady. I squeezed, the Herrett barked. Nothing. In this case a good thing because it did not run from that bush, while Buster found new inspiration to climb higher, faster. An instant later it slid from the bush, legs kicking fast and uncontrolled, a tell-tale sign that the Speer bullet had gone through brain. What a way for the Herrett to invite itself to the next javelina hunt! My day wasn’t over. After tagging and red work it would be the furthest and steepest I had ever carried a javelina. Not enough, however, to wipe away my smile. Unfortunately, Doug and Daniel never found those tracks with a critter still in them.